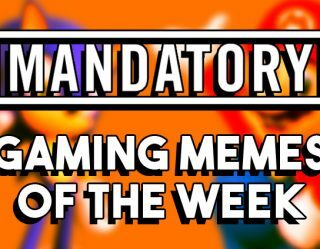 Listen to what I say, boy!” For a man that killed gods, slain titans, and destroyed temples, Kratos of Sparta faces an an even more dangerous challenge — being a father — in God of War. 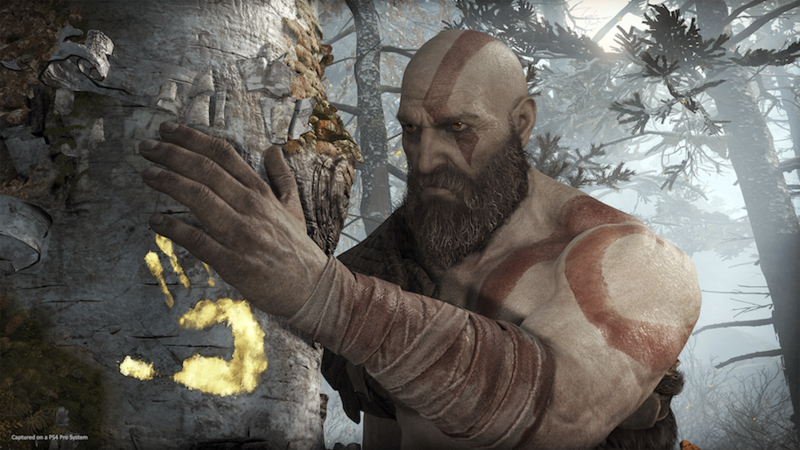 This latest God of War installment of the mythological action franchise from Sony’s Santa Monica Studio takes the raging warrior god out of his element, being an embodiment of rage and battle, and puts him in the more responsible role of fatherhood. It also takes him out of mythological Greece to Midgard, the world of Norse gods and legends. “When we were originally thinking about the game in 2003, the overall vision was that Kratos would interact with other mythologies. When I got back [to Santa Monica Studio] in 2013, I realized we had exhausted Greek mythology,” said Cory Barlog, director of God of War. This rebirth of the God of War franchise capitalizes on its newest setting almost immediately, as early in the game Kratos is attacked by an unknown Norse god, a warrior who is covered in Norse tattoos and speaks of working for Odin. From there, a journey for Kratos and his son Atreus finds him interacting with other legendary creatures of these myths: the undead Draugr, clever Dwarves, and towering Giants. 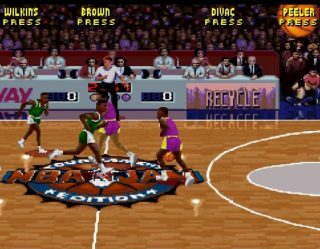 It is especially the gods that contrasts this game from past titles of the franchise, moving away from the Greek gods like Zeus and Athena to those in the Norse pantheon. Atreus is along to explains these myths and stories to Kratos, knowledge imparted from his late mother. He is the linguist who can read documents, read the art found in the ruins you explore, explaining lore to his outsider father. And like any good Norse story, our heroes take to the waters and sail between lands to reach new threats and new stories. They encounter such mainstays of the Norse mythology as the world-tree Yggdrasil, which connects all the realms in its branches, and Jorgmungandr, the world serpent, which envelopes the world in its coils. 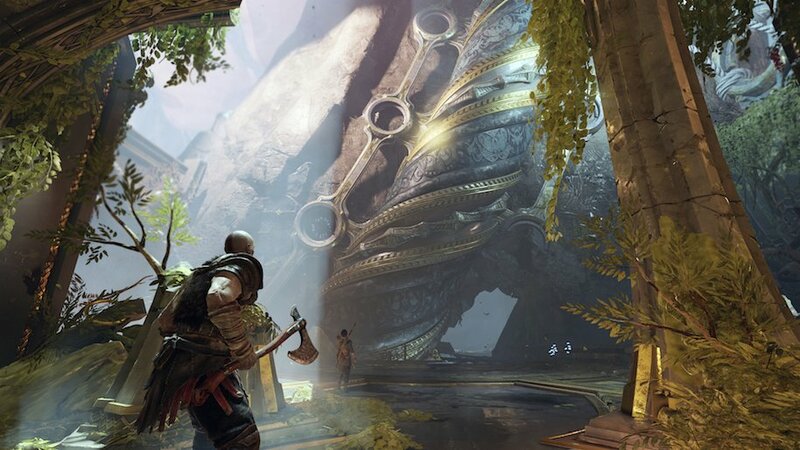 Much like the Greek mythology from previous games, this God of War uses the setting to create a rich tapestry for players to marvel at, explore, and, of course, to fight. 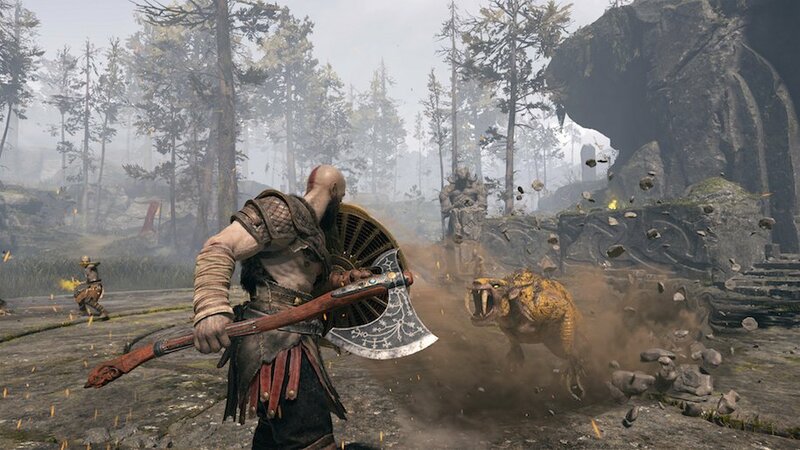 The frenetic combat of the past has shifted with Kratos’s new weapon of the Leviathan Axe, which can cut monsters with a swing or freeze enemies with a throw, as well as the addition of Atreus and his bow to fire arrows that help damage and distract their enemies. Beyond the fighting style changing, the game now has a semi-open world feel, more exploratory and RPG-like than previous God of War games. That results in more interaction with the world, more instances of the tales of the exploits of the Norse gods and the various creatures of these myths. Mythical stories come from murals and inscriptions sprinkled throughout Midgard. More personal stories of people in these myths or interacting with them come from scrolls found in the environment. And there are a variety of characters, including Atreus, tell Kratos of the mythological past of the Norse gods, and the prophecies to come. The game not only takes place in a setting of myth. It is steeped in it, immersing the player in the rich lore. The biggest shift compared to past games, though, is the fore-mentioned change in Kratos. He is now a father, protecting his son. No longer just traveling alone, he is sharing his adventure with Atreus. 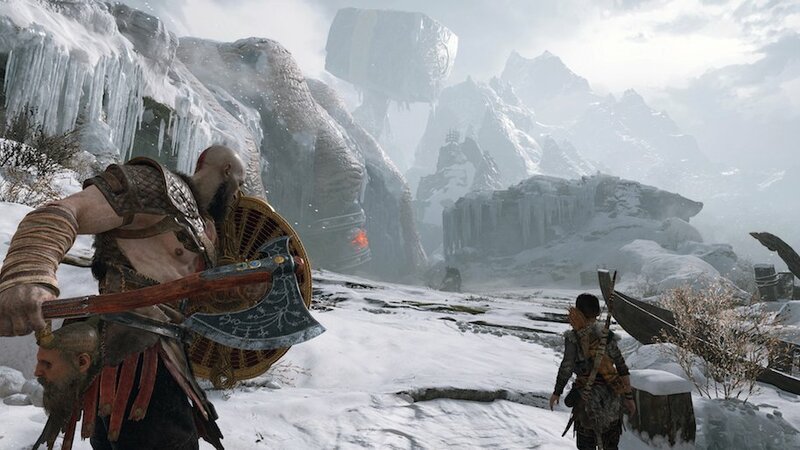 The ongoing conversations between the two characters gives this God of War its heart and is the greatest change is the personal mythology of the story. “Kratos was the epitome of closed off. He was all about being mad. In this story, so much of it is his son reminding what it means to be a human being. To be human is the full range of emotion. Strength and emotional availability are not diametrically opposed concepts,” says Barlog. 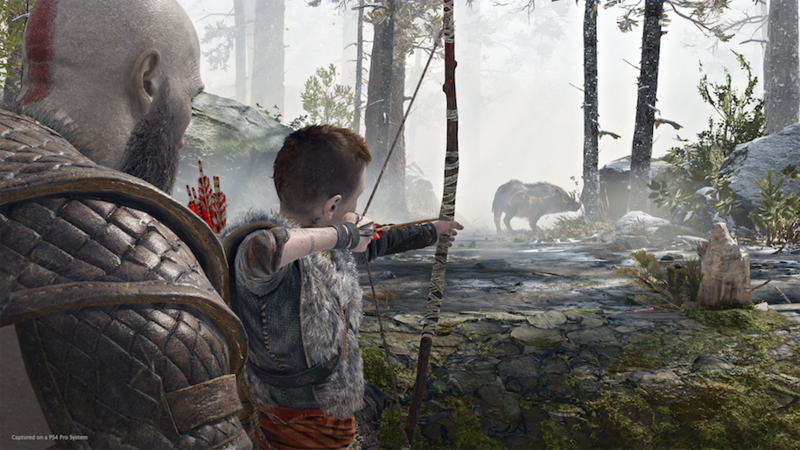 The player watches as Kratos struggles to teach Atreus to be a warrior, while dodging questions of his own bloody past as a warrior. 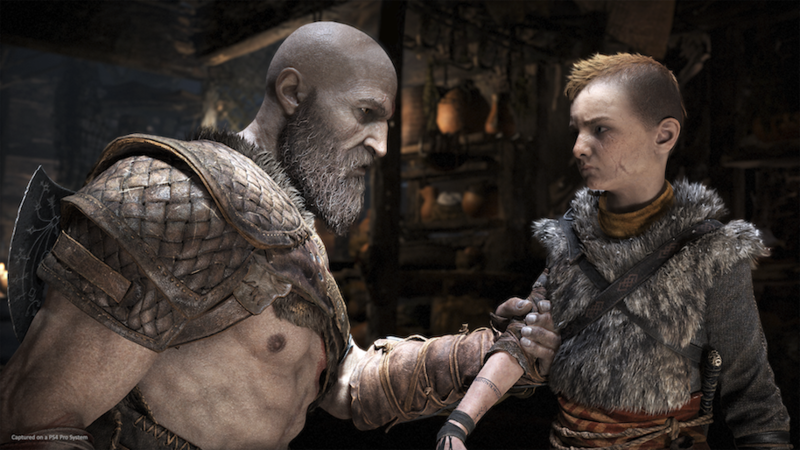 We are present as they both make gestures successful and futile to become closer to one another, now that the woman that connected them — Atreus’s mother and Kratos’s wife — is gone. Kratos is a Spartan and his stern ways and blunt lessons often do more harm than good. This personal mythology of troubled families and their secrets extends throughout the game, with other characters having other familial issues. Even side-quests of the kind found in dozens of RPGs, to gain new items or level-up your characters, feature troubled families at their core. A pair of Dwarf smiths named Sindri and Brok are in the game, brothers who craft and upgrade your equipment. They used to work together, but now can’t stand each other. The banter our pair of protagonists have with them, one at a time, is frequently about one Dwarf badmouthing the other. Much like the mythologies that inspire these games, we see family conflict left and right. 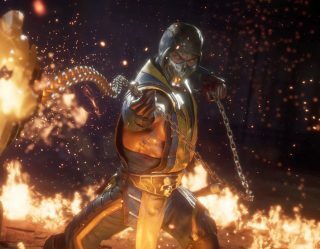 “When we go through this world, every character serves up a lesson or a warning for Kratos on how not to handle relationships. Family is a very big part of this game. Everyone is living their live and making choices. Some are good and some are bad. 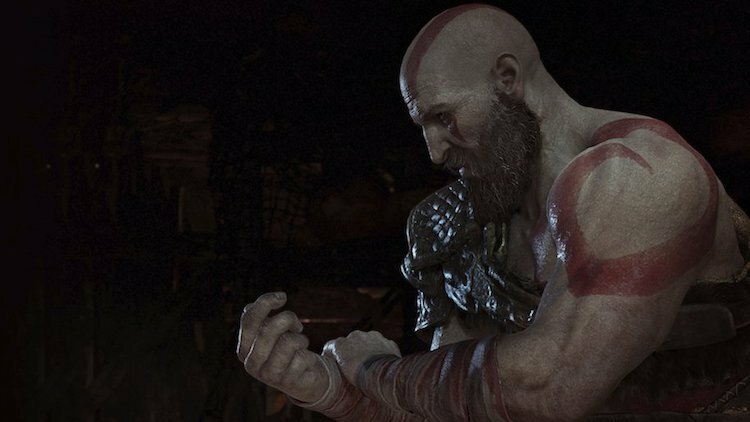 We give Kratos and Atreus the opportunity to impact or be impacted by these characters,” says Barlog. 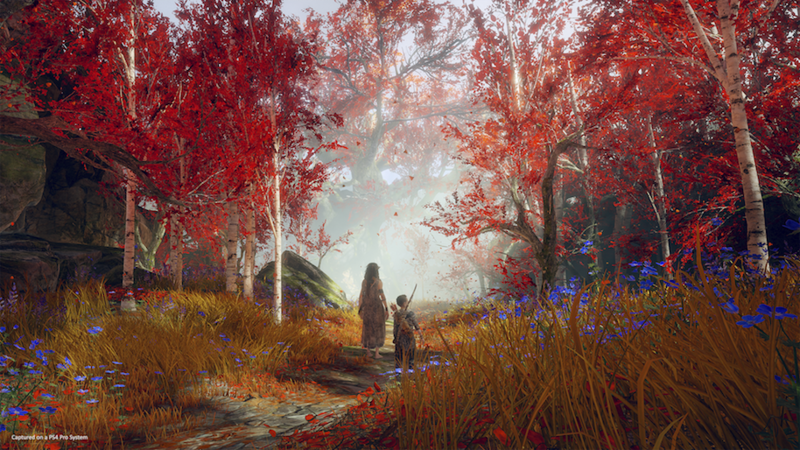 But ultimately, the game’s story is about Kratos and Atreus. Not just family, but father and son that now rely each other in every way. Kratos is the warrior, his son the linguist and scholar. 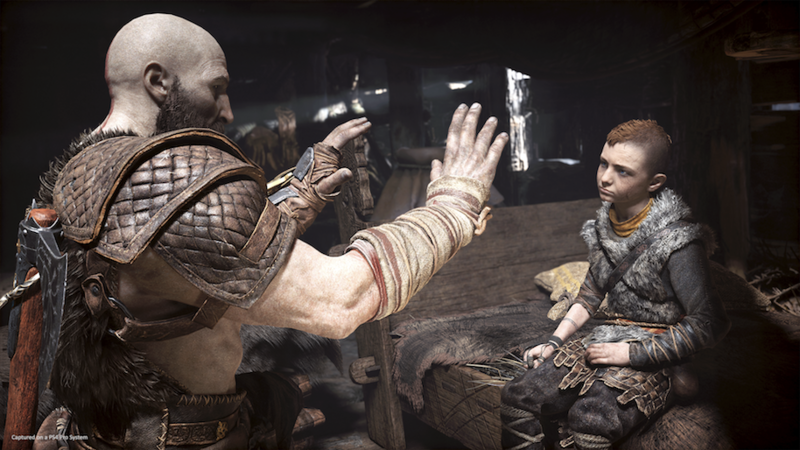 Kratos is a man who has turned to fatherhood to give him new purpose, while Atreus is a son trying to find how to go on without his mother. And as the game goes on, their relationship changes, their conversations evolve, and the player can’t help but be both moved by their actions to each other and frustrated when the player can’t simply push a button to make things better for tortured Kratos and his awkward son. 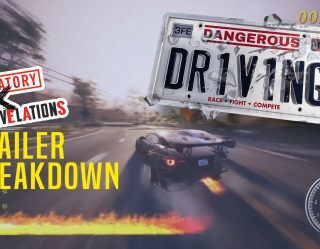 We players know the mythology of his past, his being ill-used by the Greek gods, his never-ending rage that caused him to kill his family from decades ago. And we see how Kratos tries to become a better man: through helping his son, through protecting him, and through just being with him. This mythological story about a raging warrior with a tragic story becomes a mythology we can all relate to: a man trying to be better for the sake of his children. God of War is out April 20.